Yellow Tree Theatre opened their ninth season with the American classic Death of a Salesman a few weeks ago, and has been racking up rave reviews ever since. So chances are you've already heard what an excellent production this is, and maybe you've even already seen it or made plans to. If not, I'm here to belatedly add my voice to the crowd. I've been a fan and loyal follower of Yellow Tree since their third season, and it's been a pleasure to watch their growth; they just keep getting better. Yesterday Yellow Tree announced that they are one of seven recipients of the American Theatre Wing's National Theatre Company Grant. Which is all just to say that they're doing great things at the cozy little theater in an unassuming strip mall in Osseo, and this intimate staging of an American classic featuring a brilliant cast is the most recent example. A working stiff disillusioned with the American dream is never not relevant, which might be why this play keeps being produced. 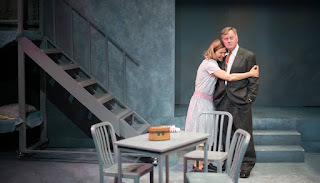 Yellow Tree, and always excellent director Craig Johnson, bring a new spin to it by staging it in their intimate space where it's almost painful to be so close to the Loman family tragedy. Patrick Coyle is outstanding as Willy, so devastatingly in the moment, and at that close distance you can see the weariness and frustration on his face, and the desperate hope as he imagines a future that will never be. 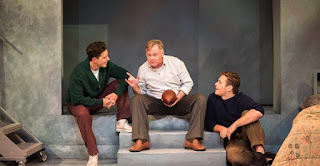 He's well matched in Laura Esping as devoted wife and loving mother Linda, with Yellow Tree co-founder Jason Peterson as elder son Biff and U of M/Guthrie BFA student Damian Leverett as younger son Happy completing the strong family unit. 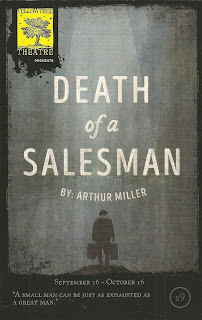 I always remember Death of a Salesman as a four-person play, but of course it's much larger than that, and the core four are supported by an excellent ensemble, some of whom only have a few minutes on stage. 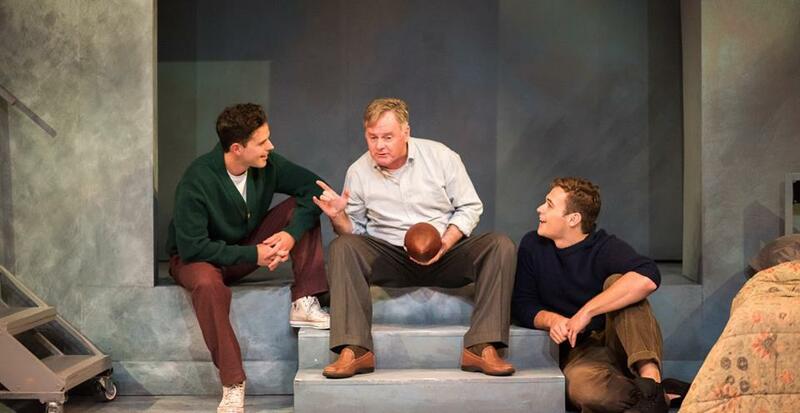 Patrick O'Brien and Alex Brightwell are the annoying uncle and cousin who are "not well-liked," but it turns out they're the success story that the Loman family isn't. David Coral is the haunting presence of Willy's brother and the road not taken, Carolyn Pool is a woman from Willy's past, and Matt Wall, Tara Borman, and Abby DeSanto fill multiple roles, adding more depth to Willy's story. There's not a lot of room in Yellow Tree's space to create the Loman's Brooklyn home, so scenic designer Michael Hoover has chosen to represent it with just a set of bunk beds on one side, which also double as the stairs, and a small double bed on the other. A few tables and chairs are brought out for the kitchen or office scenes, and the whole thing is framed by the peak of a roof in muted gray tones. The all important shadow effect is created on the back wall of the space as Willy enters his home (Lighting design by Courtney Schmitz). This classic story of hard-working dreamer Willy Loman and what happens when the American dream turns into the American nightmare is brought to new life with beautiful and devastating effect by Yellow Tree Theatre (continuing through October 16). *Plot summary borrowed from what I wrote about the 2013 production at Lyric Arts.